The purpose of the ministry for seniors is to decrease social isolation of English speaking and bilingual seniors within the church and the surrounding communities, by providing opportunities for social participation. Our goal is to affirm, nurture and celebrate the older persons within our church and the greater South Shore, by striving to meet some of their spiritual, social and physical needs. A team of volunteers organize monthly social events for their enjoyment, which include; afternoon tea/coffee, sandwiches and squares, birthday celebration and a varied program of entertainment by musicians, singers, and dancers. In order to help them feel empowered, presentations are given on a variety of topics which are relevant and informative. Each year the program starts in September and ends in May. A group of volunteers transport those who are unable to attend without our assistance. The church hall is wheelchair accessible and enables those who are challenged physically to participate. An annual Christmas turkey dinner includes, carol singing and gift giving by Santa Claus. The closing luncheon in May and the Christmas dinner are the highlights of these events and they are always well attended and enjoyed. 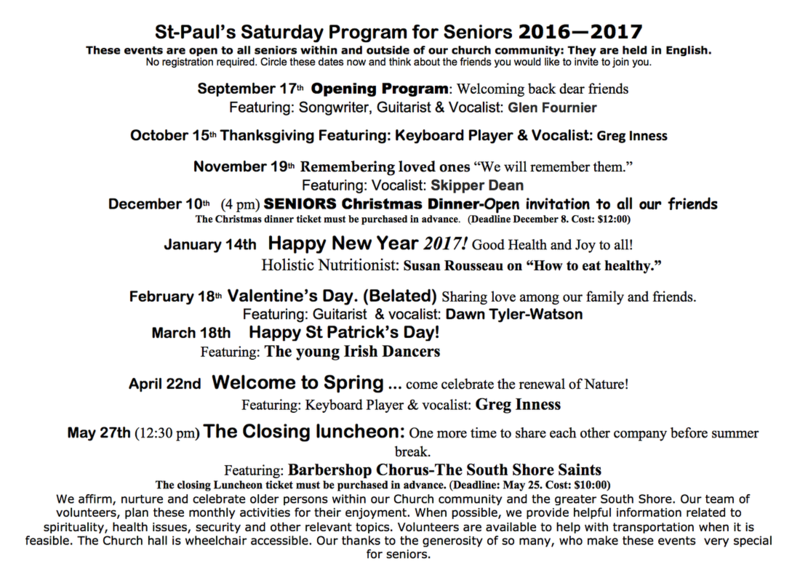 These events are open to all who are 65 years plus. To attend the Christmas dinner and the Luncheon there is a nominal cost. A freewill offering is requested at all the other events.